Coverage: Live commentary on BBC Radio 5 live sports extra and Radio Ulster, BBC Sport website and BBC Sport app, plus live text commentary online. 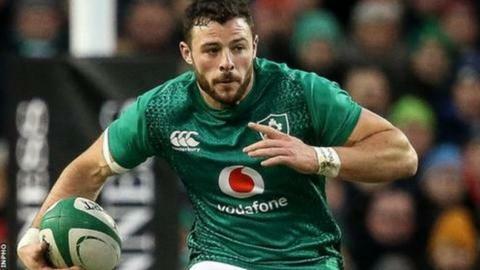 Robbie Henshaw could miss Ireland's Six Nations encounter against France on Sunday as he struggles to shake off a dead leg. Ireland have taken the unusual step of delaying confirmation of their wider squad for the game until Wednesday. Henshaw has not featured since the Six Nations opener against England. Fly-half Joey Carbery is still inching back to full tilt after hamstring trouble, while flanker Dan Leavy continues to nurse an ankle problem. Henshaw was deployed at full-back for just the second time in his Test career in the 32-20 defeat by England on 2 February. "Robbie Henshaw is improving more slowly than hoped and he will continue his rehab this week," the IRFU said on Tuesday. "Joey Carbery is progressing well through his hamstring rehab and will be managed across the early part of the week. "Andrew Conway has fully recovered from cramp suffered post the Italy game. Dan Leavy will continue to increase his running volume outside of team training in the early part of this week." Ireland would normally confirm their wider training squad on a Tuesday before a Sunday Test match, but have delayed that announcement while the nucleus of doubtful stars continue their recoveries. Bundee Aki and Chris Farrell started as centres when Ireland ground past Italy 26-16 in Rome on 24 February. The Irish had expected Henshaw to be fit and firing by now to boost those midfield options.